OK so originally I was going to build a nice small 12″ wide folded table that would serve as a sewing machine surface… instead my beloved decided to expand the project just a little bit……WOW! For Christmas week we spent time building the basic table so I could sew presents at the last-minute. My end result was a much larger table that I absolutely LOVE. It is 30″x48″ folded and 60″x48″ with the “wing” out. It is about 36″ tall and doubles as a cutting table as well as being my sewing surface. Anyway here are a couple of shots of it finally completed with the last touches on it…. a pull out shelf for projects and tools. My fabric collection is on bottom and will eventually go in a “Bento Box” style storage system allowing me to have a “neat” appearance to at least my fabric shelf. We’ll see when those get done! 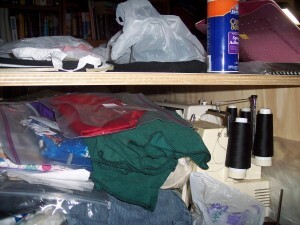 Tagged craft table, organizing, sewing, sewing storage.